Rookie Andrew Shaw scored 2:42 into overtime to give the Chicago Blackhawks a 2-1 win over Vancouver Canucks on Wednesday night, a game in which Canucks star Daniel Sedin left after getting elbowed in the head. Goals just keep finding their way into the net for Blackhawks rookie Andrew Shaw. He scored 2:42 into overtime to give Chicago a 2-1 win over the Vancouver Canucks on Wednesday night. Shaw was credited with deflecting Johnny Oduya's shot from the slot past Roberto Luongo. Oduya fired from between the circles after he trailed in late and took a feed from Dave Bolland on the left boards. "It hit me in the shin, lucky left foot, I guess," Shaw said. "They're going to go off me and in. I just go to the net and work hard." Canucks leading goal-scorer Daniel Sedin was injured in the game and did not return. He may have been hurt when he was elbowed in the head by Chicago defenseman Duncan Keith late in the first period. The Blackhawks and Canucks have squared off in emotional postseason series each of the past three years. And the feelings resurfaced Wednesday night. "Everybody saw the head shot there, so [Sedin will be] re-evaluated tomorrow and I'll know more from there," Canucks coach Alain Vigneault said. Vigneault called the hit a "deliberate, principal point of contact, everything you're trying to take out of the game." Keith, the Blackhawks top defenceman at the 2010 Norris Trophy winner, received only a minor penalty on the play. "I expected a major, and I got a minor, so we'll let the league deal with it," he added. "You saw the hit, you didn't see a puck near the hit, you guys make the judgment call on that and the league will do what they have to do." "I'm not trying to hurt anybody," Keith said "I hope he's OK. He's one of their best players. He needs to be on the ice." Shaw, who has been earning added ice time, has four goals and two assists in his last three games. In 30 games this season he has 11 goals — including two game winners — and seven assists. "Offensively [Shaw's] got some nice play recognition and a nice set of hands as well, even if he uses his pads [to score," Chicago coach Joel Quenneville said. "Whether you use a term [like] fearless or gutsy— you could add some more terms to that — but you appreciate the way he competes for either himself, or his teammates, or his team. "You seem to use him as the game gets even more important. I don't think I've used him that much in the past in four-on-four but he did a good job tonight." Patrick Kane scored his 20th goal in the second period for Chicago, which has won five straight and is 9-1-1 in its last 11 despite playing without captain Jonathan Toews. Jannik Hansen scored in regulation for Vancouver — on the first shot of the game — to break a 15-game streak without a goal. The Canucks lost their second straight, and have won just one of their last five. Chicago centre Marcus Kruger also left the game with an upper body injury. Luongo made 35 saves in his return after backup Cory Schneider had started Vancouver's previous two games. Luongo was 0-3-0 and had given up 16 goals on 103 shots in his last four starts — including one no-decision where he allowed three goals on seven shots in the opening five minutes before being relieved by Schneider. Chicago's Corey Crawford made 23 saves and in his fourth straight start. He has won five straight. The contest between the Western Conference rivals, their 35th over the past four seasons including regular-season and playoff games, was punctuated with penalties and skirmishes. The teams' mutual dislike reached a boiling point midway through the second period when several wrestling matches erupted in front of the Chicago net. 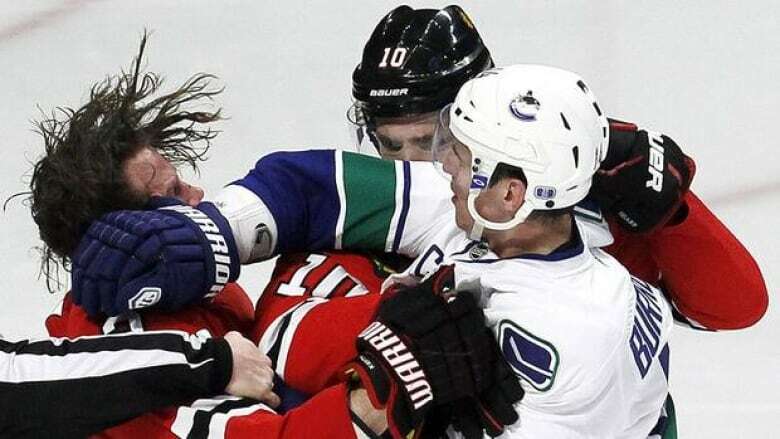 The Canucks appeared to be targeting Keith, who eventually tussled with Alexandre Burrows. Both players received roughing and misconduct penalties. Hansen scored the only goal of the first period just 27 seconds in. After gaining a step on Oduya, Hansen beat Crawford from the right circle. Crawford misplayed the rising shot, giving Hansen a wide gap on the stick side after dropping too quickly to the ice. Although the Canucks had all three power plays in the first, Chicago outshot Vancouver 12-6. Luongo was sharp in the opening 20 minutes, stopping several tough chances, including a point-blank deflection by Marian Hossa midway through the period. Kane tied it at 1 at 3:12 of the second to cap a strong shift and crisp passing play with linemates Hossa and Andrew Brunette. After Brunette fed Hossa behind then net, Hossa feathered a centering pass to Kane, who lofted a shot past a diving Luongo from the slot. Kane scored 5-on-5, but then the Blackhawks failed on five power-play chances in the second. Crawford had to be sharp in the third as the Canucks began to dominate. After taking just nine shots through two periods, Vancouver loosed 14 in the third. Several were tough, close-in chances.